New collection! The 50s Dolores dress Mon Cherie from Collectif. 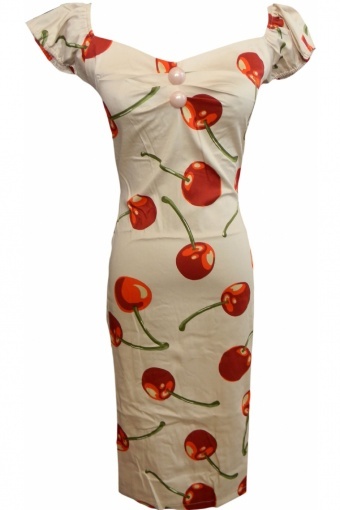 This is a fun cap sleeve stretch cotton wiggle dress in a beautiful cream beige big Cherry print! The soft stretch sateen coton fabric will hug all your curves and is super cute and sassy with a small pucker in the bust and a back zipper. Back slit creates ease of movement.